Yay I got invited to interview! But oh my goodness, now I’m totally freaked out and have a million questions; What are they going to ask? Should I be myself or should I open with a joke I read online? Should I bring my resume in strawberry-scented triplicate? What do I wear? Should I interview on-campus, via Skype, or off-campus? Is it better to interview with a current student, admissions officer or alumni? Should I send a follow-up thank you via email, hand-written card, or none at all? How do I set up the interview in the first place?! Eeek! Breathe. Like anything else, your MBA interview invitation is an opportunity. While some applicants may look forward to it, others may not exactly enjoy the anxiety. If you are a member of the latter group, look at it this way: This interview can be just the thing the Admissions Committee needs to stitch together the rest of your application elements with a genuine, prepared, and poised interview performance. The interview affords one of the only formal opportunities for official face-to-face interaction during the application process. Seize it. You are most likely applying and subsequently interviewing with multiple MBA programs. This means managing several different interview processes, a complicated project given the variability among schools. 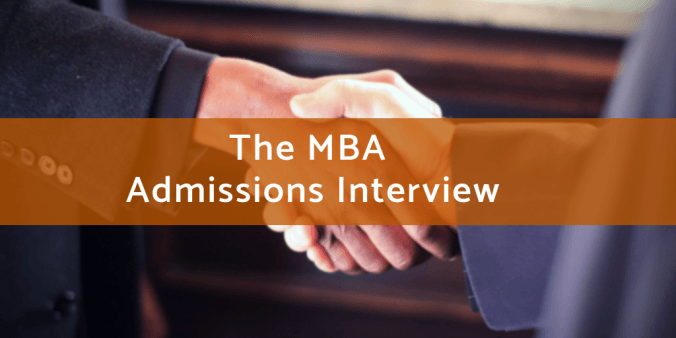 It’s important to be familiar with how the Texas MBA program runs its interview operations. Interviews are by invitation only and can come at any time during the application Round. There are three different interview types: On-campus with a current student or admissions officer, off-campus in your local city or hub city location with an alumni interviewer or admissions officer, or via Skype with a current student or admissions officer. For each type (excluding alumni interviews) there is an online calendar from which you can select an interview slot that works with your schedule over a period of a few months. We will inform you of the last date your interview needs to be completed. The only exception to this is that booking your alumni interview off-campus in your local city follows a slightly different process, but we provide the step-by-step instructions if you decide to go that route. Most interviews follow the general framework of introductions, questions from the interviewer for you to answer, then some time is left at the end for you to ask your questions about the program and/or application process. Once the interview is completed, you are finished! There is nothing further you need to do and your application is considered complete. All that’s left is to wait patiently for our final decision in the weeks that follow. Choose Wisely: Decisions, decisions. Interview type selection is like deciding on your coffee order at Starbucks – copious options, but there’s something for everyone. Each type of interview affords individual benefits. If you’re located proximate to Austin, try to come to campus for an interview. If you have never been to campus or met us in person before, we highly recommend interviewing on campus to get a feel for the facility and community culture. You might even be able to book a class visit, information session, or tour and interview all in the same weekend. If you can’t make the trip due to work conflicts or you are internationally-based, you might consider taking advantage of our alumni interviewers in local cities. Interview hub markets like New York, Seoul, China, India, Chicago, San Francisco, DC, and others are among the options. Or maybe none of that works for you and Skype is the only way to get it done. No problem, we’ve got options so you can choose what works best for you. We see your interview type selection as entirely logistical and do not hold it against you if you don’t interview with us on campus. Don’t Be On Time – Be Early: Arriving early is “Interviewing 101”, yet it still manages to falter even the most prepared of candidates. Arriving early is even more critical if you’ve never been to campus or navigated UT parking before. As for Skype, your instructions ask that you are prepared to begin the Skype video call at the allotted interview start time, but it’s always a good idea to arrive 5-10 minutes prior to work out any inevitable technological hiccups that crop up. “And that’s why I’m scared of heights and allergic to strawberries…Wait, what was the question again?”:  You’d be surprised how many times at the end of an applicant’s long-winded tangential answer we are asked to repeat the original question. Most often this happens to people who try to cram too much into the first answer for fear of not being given an opportunity later on to address that well-rehearsed example. Don’t worry, we’ll get to it! Plus, sometimes there is an opportunity at the end of an interview to mention anything we didn’t address in the formal line of questioning. Loosen Up: Given our program’s famously friendly culture, our interviews are relatively informal. If you still find yourself nervous, practice your answers in front of a mirror, a friend or a willing stranger and ask them how you did. Did you answer the question? Did you rush through it? Take a moment to outline your answer in your mind first, and then address it calmly and confidently. Don’t get too comfortable, though. While we’re an easy-going bunch, maintaining an appropriate level of professionalism is always a good idea. This includes professional language and attire as if you were interviewing for a job (that means you too, Skypers! I’m sure your pajamas are lovely, but we’d much rather see a blazer.). Know What We’re Looking For: We listen for confidence, clear and concise communication of career goals, concrete examples of teamwork and leadership, in-depth knowledge of our MBA program, and overall genuine enthusiasm. Also, the interview can be a place to showcase secondary skills that are difficult for us to determine solely based on your application: Interview skills, self-awareness, communication style, and “hire-ability.” Keep these in mind so we can get a feel for the application intangibles. Know Your Audience: Remember the Admissions Committee doesn’t have a preference for which interview type you elect or who you interview with, just as long as you prepare for your audience. Since you can’t always tell who is going to interview you (interviewers can change since we conduct hundreds of interviews in a given round), you can do a little recon based on the name of the interviewer. You can check out our current student and alumni interviewer profiles on our website, or read about our admissions officers in the Admissions Committee section. That way you know what you’re in for. While our interviewing style is admittedly less intense than corporate recruiters, don’t let our laid-back Austin attitude fool you. The Admissions Committee uses the interview as a way to add character, depth and spirit to your written application, so keep these tips in mind to ensure a positive outcome. Good luck!